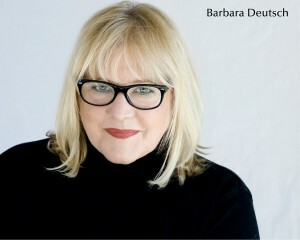 Barbara Deutsch is the creator of the Barbara Deutsch Approach, a unique teaching and coaching concept for people in the film and television industry. As a successful acting teacher and coach, Barbara knows about dreams: the rewards of their pursuit, and the sorrows of feeling stuck. Bringing over 25 years of experience to the table, she works with those in front of the camera and behind the scenes acting as a Personal Champion, and consultant. Barbara started working in the entertainment industry shortly after the Beatles became popular for the first time. Beginning on the East Coast, Barbara was “discovered” by the legendary Clive Davis while standing on a coffee table at Epic Records singing to her fellow secretaries. After witnessing her performance, Clive said to her boss, “Either fire her or sign her.” Along with her handling production for Epic records and heading the department promotion for Scepter Records, Epic signed her to a recording contract. Within a year she earned the coveted role singing “Day by Day” in the first national tour of GODSPELL. Making her way to the West Coast, she raised a family and pursued a successful career in television, stage, film, and commercials. During this time she was also a successful and sought after acting/improvisation teacher. Barbara’s intense interest in people and the complexities of business and personal relationships outshone her need for the limelight. In 1989 Barbara joined a Los Angeles based consulting company specializing in the enhancement of people’s personal lives and professional careers. She soon became a partner leading the company through an expansion of its scope and client base, while publicly speaking to a variety of forums. In 1997, Barbara formed her own company “The Barbara Deutsch Approach,” which focuses on people in any stage of transition. When most people think of the entertainment industry, they think only of the performers. Although these performers are a large portion of Barbara’s clientele, there is also the industry side of entertainment to be considered and constitutes a percentage of her client base. Whether you are shy or aggressive, Barbara teaches you how to act or build your acting or industry related career based on the ability to act from freedom , not perfection, enter the industry by presenting yourself in a way that is powerful and productive and results in positive outcome. When the creative work is done, what matters, is how you talk about yourself and your project. She teaches the importance of connecting authentically. Learning this makes the difference between creating meaningful relationships in the industry, or stopping them in their tracks. Her unique ability to speak to actors in a voice they understand, and teach non actors to present effectively ( using acting and improve techniques she mastered as a performer and coach) makes her unique as and inspired teacher. People work with Barbara when they are ready to raise the bar, expand their business and take it to the next level. It doesn’t matter to her whether something is wrong or something is right with your career – it’s all about what you want, where you want to go and how you want to get there. Barbara’s clients include well known actors, directors, producers, writers and talk show hosts. She just completed teaching at Second City in Toronto. She teaches workshops in Vancouver, Toronto, Los Angeles, Chicago and New York. Barbara has been the special guest speaker at WIF, SAG, AEA, Whistler Film Festival. Barbara provides straight talk and quick results, delivered with humor and compassion.